Background: Horner syndrome refers to a set of clinical presentations resulting from disruption of sympathetic innervation to the eye and adnexa. Classically, the clinical triad consists of ipsilateral blepharoptosis, pupillary miosis, and facial anhidrosis. Ocular sympathetic denervation may signify life-threatening causes. Timely investigation and accurate diagnosis are essential in patients with oculosympathetic denervation. Case presentation: A 33-year-old Asian man with a heavy smoking habit presented with a 3-week history of left ptosis and no other complaints. His visual acuity was 20/20 bilaterally. An ophthalmic examination was significant for mild ptosis of his left eyelid and anisocoria (smaller left pupil), which was greater in the dark. 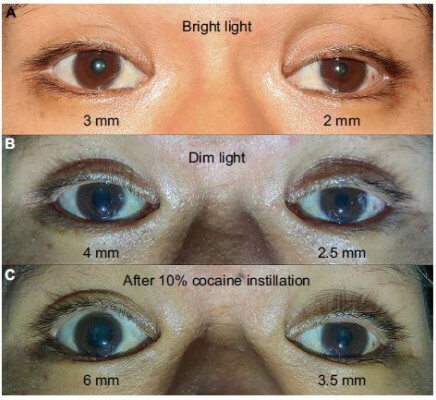 Both pupils reacted to light briskly without an afferent pupillary defect. Anhidrosis was found on the medial side of the left forehead. A 10% cocaine test was positive. At his first visit, neurologic examination was unremarkable. Comprehensive radiological investigations were scheduled for a left-sided isolated Horner syndrome. Two weeks after his first visit, he experienced a left-sided headache along with ipsilateral Horner syndrome. Neurologic examination revealed hypoesthesia in the left cranial nerve V1–3 territories. Emergent computed tomography angiography was suspected for petrous part of the left internal carotid artery (ICA) dissection. Magnetic resonance imaging demonstrated an enhancing infiltrative lesion with its epicenter at the left sphenoid bone. The lesion encased the left ICA and invaded the left Meckel cave. Rhinoscopy with incisional biopsy revealed squamous cell nasopharyngeal carcinoma. Conclusion: This case involved an unusual initial presentation of nasopharyngeal carcinoma: isolated Horner syndrome with clinical progression to adjacent structures. Infiltration involving the Meckel cave and ICA at the foramen lacerum can present as postganglionic Horner syndrome associated with trigeminal pain and hypoesthesia. These clinical findings may mimic carotid artery dissection on computed tomography angiography. Detailed magnetic resonance imaging with careful attention to the skull base should be performed.